Certified as an American Heart Association (AHA) Training Center means Emergency Response Training has passed stringent AHA requirements ensuring that we have the proper equipment and training. In addition, ERT has also won a “Certificate of Outstanding Performance” from the AHA for the quality of our courses. There are lots of folks who teach CPR, but ERT is dedicated to providing the best CPR education possible. We’ve had experienced paramedics taking our classes saying “I learned more about CPR here than in any other course I’ve had.” Of course, we are one of the first training centers to offer courses based on the latest American Heart Association’s guidelines. We provide these courses in our training center, or on-site at your place of business, school, fitness center, etc. for groups of 6 or more students. When an emergency occurs that causes someone to stop breathing or lose their pulse, the end result is usually death unless someone nearby knows CPR (Cardio Pulmonary Resuscitation). Brain death begins in 4-6 minutes. Brain death is assured in 10-12 minutes. 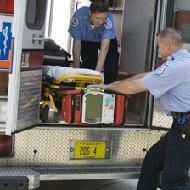 Waiting for an ambulance and trained medical personnel is not an option. You can make a difference! We offer the AHA “Family & Friends”, and “Heartsaver CPR/AED” courses for the non-professional who wants to be prepared in case of an emergency. Recognize the signs and symptoms of a cardiac emergency and choking. Know what to do for Adults, Children and Infants. Learn to use Automated External Defibrillators (AED). And do so safely by using a 'CPR Barrier Device'. Are you concerned that “one quick class” might not make you comfortable performing CPR in an emergency? We are the only training center to offer a guarantee! Take our Heartsaver CPR/AED course at our Woburn training center and, if you do not feel comfortable, come back within the first three months to repeat the course as many times as you like, free!. Our training center based HeartSaver course is the full program; Adult, Child and Infant CPR, AED, choking, and barrier device use. Classes are offered on a regular basis. See the course calendar for details. Course fee is $50 per person, plus materials—text book and barrier device ($25). Walk-in registration is accepted, but to reserve a confirmed place in the class, please register in advance. For those that do not require a certification card or the full program, the Family & Friends program offers a two-hour course to learn the basics of CPR. This course is ideal for schools and students, new parents, grandparents, babysitters and others interested in learning how to save a life. The course includes both “standard” CPR (with breaths) as well as “Hands-Only” CPR, recognition of an individual suffering from a heart attack as well as an introduction to Automated External Defibrillators (AEDs). Course fee is $75 for two participants. These courses are both scheduled regularly as well as offered on your schedule. Contact our office to set up a course just for you! For organizations, our courses are designed to be flexible to fit organizational needs. All courses include Adult and Child CPR and AED use, but Infant CPR and Bloodborne Pathogens are all optional components; we will tailor a course to your needs. Classes range from four to six hours depending on options selected. We provide on-site instruction for groups of 6 or more with no travel fee! This course is intended for anyone working in a first-responder capacity or works in a healthcare setting. All nurses (RN, LPN, CNA), MDs, Dentists, EMTs and Paramedics must be current at this level. In addition, other healthcare providers such as Physical Therapists and Chiropractors, as well as personnel in the office, should be certified to this level. 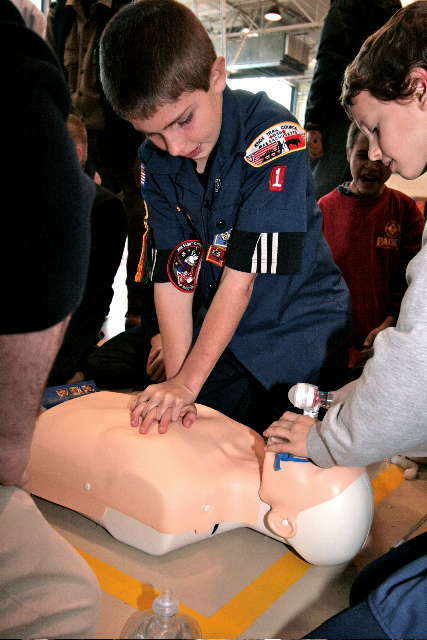 The course includes CPR techniques for all age groups—Adult, Child and Infant. It includes use of an AED, barrier devices and Bag Valve Masks. Finally, it includes relief of obstructed airway techniques. We offer classroom and on-line versions of the class. See the course calendar for upcoming course dates. Fee for the initial classroom course is $65/person, plus materials—text book and barrier device ($25). Walk-in registration is accepted, but to reserve a confirmed place in the class, please register in advance. The on-line course requires that the student take the “HeartCode BLS” course from the AHA. Once that two-hour course is complete you may take the three-hour “BLS Skills Session.” The advantage of this approach is increased flexibility combined with smaller class sizes in the skills session. These classes will be available starting in 2019. Contact our office for further information. ERT has nationally recognized Regional Faculty and Training Center Faculty on staff that teach, mentor and monitor CPR and First-Aid instructors. Becoming an instructor is more of “a process” than simply taking a single course. We teach one of the most comprehensive Instructor courses in the area! The instructor program is two-days with the first day being a BLS Provider classroom course. The goal is to have you take a course taught by an AHA faculty member to ensure you have received the best, most complete course possible. In addition to evaluating your skills at the provider level, we also assess whether we believe it is appropriate for you to take the instructor course. Should you not take the instructor course, we will provide a full refund for that portion of the program. The course educates instructor candidates on how to adequately use AHA Instructor teaching materials, ensure that students meet learning objectives, offer student coaching skills, provide an objective skills performance evaluation, and follow AHA Instructor and course policies. The course covers core content and discipline-specific content required to teach AHA courses. For BLS Instructors wishing to teach Heartsaver courses you only need to complete the BLS Instructor Essentials course, not both. Please bring the completion certificate from this course to the instructor course or email it to ERT beforehand. The second day is the instructor course which primarily covers course administration, manikin maintenance, CPR skills assessment and CPR Science. However, it does not go through actual teaching skills; its goal is to make sure you know everything you need to know to go into the classroom and teach. On completion of the program you will join an ERT Faculty member for two CPR courses where you will co-teach those courses. This is where you learn to teach! Generally, for the first of these courses you will monitor a course taught by a faculty member and assist with the course. For the second, you will teach the course with the faculty member observing. On successful completion of these two courses you will be a certified AHA Instructor. Once certified to teach, you must then be affiliated with an AHA Training Center. All students completing our instructor program are welcome to affiliate with ERT. We offer our affiliated instructors competitive pricing on certification cards, use of our training center classroom and equipment for a nominal fee, and discounts on AED Trainers. These may be purchased after you complete the provider course but you must complete the Instructor Essentials course and review the materials (instructor manual and DVD) prior to attending the instructor course. All instructors must have access to their own training materials. Generally speaking that means manikins (with feedback devices), AEDs, pocket masks, and Bag Valve Masks (for BLS). During the instructor program we will go over what is required and our recommendations for equipment. For dates and times of all courses offered in our Woburn training center, please check our Education Calendar.